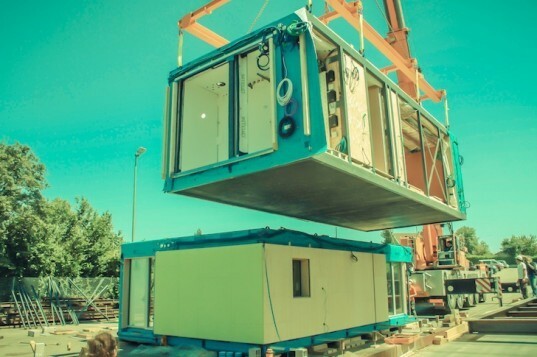 While most of the Solar Decathlon Europe 2012 projects we have featured so far focused on just one 75 square meter solar-powered dwelling, Canopea comprises a collective of small buildings that form a healthy green habitat in dense urban settings. Team Rhône-Alpes only built one prototype for the collegiate design competition that will be open to the public in Madrid beginning 14 September, 2012, but they will also introduce a concept that includes 69 of these compact solar-powered dwellings organized around a unifying vertical farm. 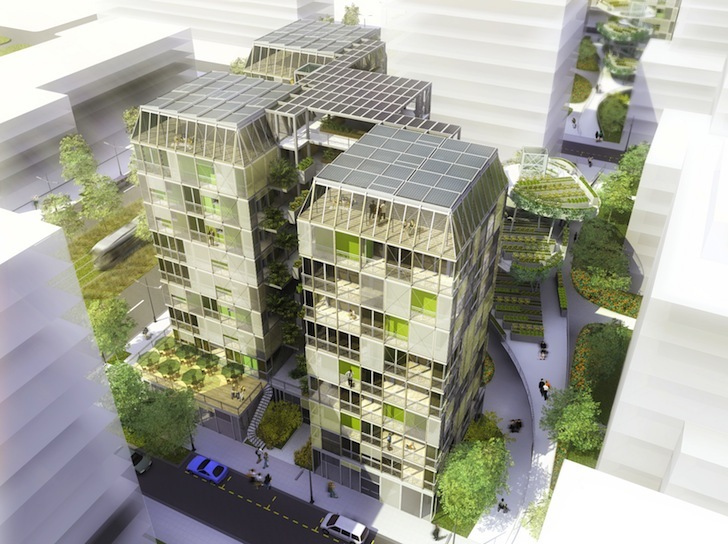 Taking inspiration from tree canopies that absorb 95% of the forest’s overall solar energy and capture 30% of the rainfall, the nanotowers are less than 10 stories high and each floor is its own home. The top floor below spaces beneath the photovoltaic canopy are shared and play host to laundry and cooking facilities as well as a small recreation area. Clusters of nanotowers are linked with passageways filled with gardens, storage areas and recycling facilities. In order to optimize energy conservation, each of the nanatowers that make up the Canopea are connected to smart grids that manage all of the heating and cooling systems, in addition to a variety of other services that can be monitored with touch pads. While the team from Romania eschewed super high-tech solutions, team Rhône-Alpes has embraced it wholeheartedly. The 75 square meter unit that the team has developed for SDE 2012 comprises the bottom two floors of one nanotower. It features a master bedroom, bathroom and additional room with a lot of flexible open space along with large bay windows in the living room that open to an outdoor garden. Earthern walls create a pleasant internal environment while operable louvers permit natural ventilation and daylighting. And finally the roof is composed of silkscreened bi-glass photovoltaic panels. Conceptually one of the more complicated projects we’ve seen to date, we’re looking forward to seeing the final product in Madrid. Stay tuned! Things are a little square for my liking, but still a impressive attempt/achievement. We're looking forward to seeing this ambitious urban intervention in person!